In February 1986, after an article appeared in The Coast Dispatch and The Citizen newspapers, several interested people came together at George’s Restaurant on Coast Highway in Encinitas to discuss forming a surf museum. The dozen or so people who showed up for that first meeting became the founding board, a mix of men and women, surfers and non-surfers, connected by an avid interest in surfing and a desire to collect its history for the enjoyment of generations to come. The founding members were Mike Cates, June Chocheles, Don Fine, Steve George, Kevin Kinnear, Parry Payne, Stuart Resor, Jane Schmauss, Ian Urquhart, and Catherine Woolsey. The California Surf Museum took shape as a small display of surfboards and surf collectibles at George’s Restaurant, owned by Jane Schmauss, in 1986. The restaurant was open 7 days a week and had a little corner alcove dedicated to promoting the museum concept. 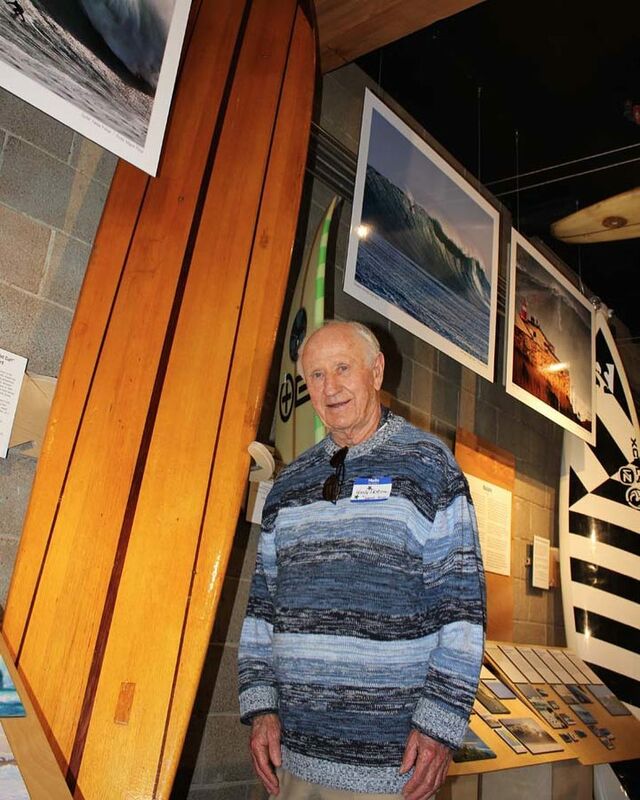 The Board voted to use the name “California Surf Museum” after discussing the merits of the Encinitas Surf Museum, the North County Surfing Museum, and numerous other names, believing that the broader term would one day link to a string of museums up and down the coast, such as the “California Surf Museum, Ventura,” and the like. After many months of organizing and putting together a logo design contest (won by Ed Nava), Encinitas businessman Paul Rotsheck offered the fledgling California Surf Museum free space in his newly built Moonlight Plaza, on the corner of Encinitas Boulevard and the Coast Highway. CSM mounted its first exhibit, “Surfing: Trestles to Tourmaline,” on August 13, 1988, with a grand opening September 28, 1988. A second exhibit, “Iron Men, Wooden Boards” was in place when CSM got the word that the small retail space had been taken by a paying tenant. The California Surf Museum found similar space at the Promenade Shopping Center, 4150 Mission Blvd. in Pacific Beach, opening there in 1989. In 1991, by chance encounter between CSM member Dave Hanson and a local real estate agent, word came of the availability of The Pride’s Inn, a bar at 308 North Pacific Street, across the street from the Oceanside Pier. The property owners, Jim Keenan and Jim Watkins, graciously offered the building and the entire city block on which it sat, rent-free to the California Surf Museum until that time when they would develop the property. [This block now houses the Wyndham Hotel and the restaurant 333 Pacific. ]The building needed serious restoration before it could house a museum. Volunteers donated countless hours and businesses donated supplies to turn an old, worn out bar with a stunning ocean view into the California Surf Museum’s new home. Volunteers kept the doors open, but it soon became apparent that someone needed to be hired to run the growing museum. The board of directors hired its first employee, Rich Watkins, as Museum Administrator, in late 1991. Rich, a long-time surfer and Vietnam veteran, brought just the right amount of first-hand knowledge and dedication to the job. He planned on staying 5 years, but ended up staying 11-1/2! With the large outdoor space, CSM was able to host great gatherings with great food — bringing together many surfers and friends of all ages. It is during this time that CSM was able to begin recognizing those who the sport seemed to be forgetting, holding CSM’s first “Old Timers’ Day” on February 28, 1993, and honoring Whitey Harrison, Faye Baird Fraser, Don Okey, Bud Browne, LeRoy Grannis, Dale Velzy, Phil Edwards, Flippy Hoffman, Woody Ekstrom, John Blankenship, Skeeter Malcolm and many others. Over the years, dozens of swap meets, birthday bashes, and luaus in honor of various surfing luminaries were held on that lot. This small museum was quickly becoming a gathering place for people interested in surf history. Although the location across from Oceanside Pier was everything, the building was neither structurally sound nor weather-tight, and in 1995 the City of Oceanside — having taken notice of what we were doing and how many visitors we drew annually — offered the California Surf Museum new space at the corner of North Coast Highway and Pier View Way, formerly a Rexall Drugs. Although the space was much smaller, and there was no area for outdoor entertaining, in 1996 CSM moved to the highly-visible corner, where we stayed until 2009. This building needed lots of work too to make it usable for a museum, and again numerous volunteers donated countless hours and tracked down supplies to transform the space. Clothing company No Fear gave a generous donation that helped us construct a pleasing interior. Glenn Sundby donated exhibit display cases he had used in his Gymnastics Museum; these helped define the exhibit space. The doors officially opened at 223 North Coast Highway on July 5, 1997. Once happily configured, CSM put on some terrific exhibits, held booksignings, had special guest appearances, annually recognized a major surfing legend, and continued to build a strong member base. Museum collections software was purchased and a dedicated fan, Carole Enmark, was hired to begin digitizing CSM’s growing collections — starting with the hundreds of surf magazines. With the help of longtime supporter John Elwell, CSM published a photo book in 2007, Surfing in San Diego, the first attempt to document the history of surfing in the county, based on the stories and images CSM had been collecting for almost two decades. A True Museum Quality Space: Renovated for CSM! In 2006, the City of Oceanside again offered a new, larger space to CSM: 312 Pier View Way. After unanimous approval of a façade designed by Architect Louise Ravera Balma, and meetings for permits with Oceanside officials, construction began in August 2008 with DLS Builders taking on the project. Once construction was complete, CSM staff, the board of directors and many volunteers once again put in countless hours to finish the space. Defining much of the space, TransWorld Media donated office furniture and more, Oceanside Glasstile donated the mosaic on the stunning serpentine WOW Wall, and Trio Display helped design the Museum Store. In 2009, CSM moved into this renovated facility, tripling our space and finally giving CSM the opportunity to properly showcase surfing’s history and culture. In March 2011, the California Surf Museum was awarded a coveted Museum Assessment Program grant by the American Association of Museums.